A couple of weeks ago David from Malta was at a conference in London and with phones running out of credit and communication through his wife back home we managed to meet up in central London one evening. David is a thoughtful guy – as you can tell from his blog – and I always enjoy talking to him about politics, life and anything in between. The week after we had another blogger passing through. This time it was Karen from Wisconsin. She had to leave Prague prematurely due to visa issues but was heading back to try again. On the way back to Prague she was making her way through Europe and London was the first stop. We had some entertaining days with Karen who was excited to be here. 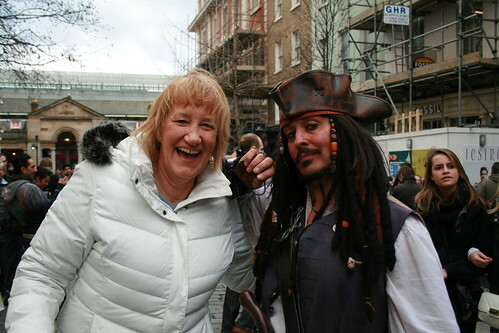 Here she is at Covent Garden with a Jack Sparrow look-a-like (and smell-a-like). This weekend we again should thank a blogger for the entertainment. At the Blogger Meetup in February there had been a competition for rugby tickets and although we didn’t win (Ann got really close). However Peter – one of the winners – wasn’t going to use his tickets and gave them to Ann. I was soo excited about the chance to see a rugby game and had been looking forward to it for weeks. But yesterday as we were starting to get ready to get out the door we couldn’t find the tickets… We looked everywhere and got the room cleared out but the tickets didn’t appear. I grumped about the lost tickets for a couple of hours but luckily enough we had an alternative event to go to. Instead we went to The Barbican for a show called the The Manganiyar Seduction where a group of 43 folk musicians from Muslim region of India was sitting in boxes as they played. A very impressive show as you can see in the clip below – but still a poor replacement for a rugby match. Anyways big thanks to Peter Marshall for the rugby tickets, that was a nice gesture. He blogs about photography at Re:Photo and writes about the many protests and walks he photographs in My London Diary. Peter has been walking around London taking pictures since the 70s and has some really interesting stories and observations. Last weekend two guys from Madrid stopped by our place for a couple of days. I didnt know them and they didnt know me but they found me on the website Hospitality Club (HC) where travellers can find free accommodation. Ive been a member of the site for two years but so far I hadnt used it myself and wasnt home when people wanted to stay at my place. This time it worked out – and it was a blast. 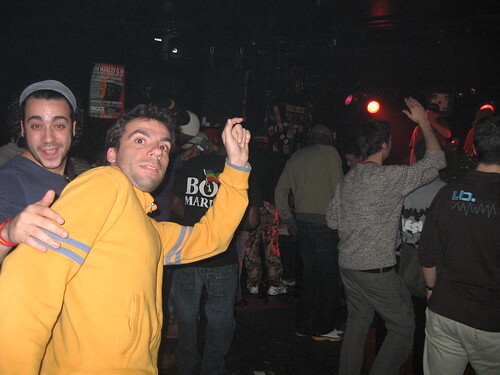 The cool thing about HC (and other sites like CouchSurfing) is that everybody gets something and it doesnt cost anything – social software at its best. 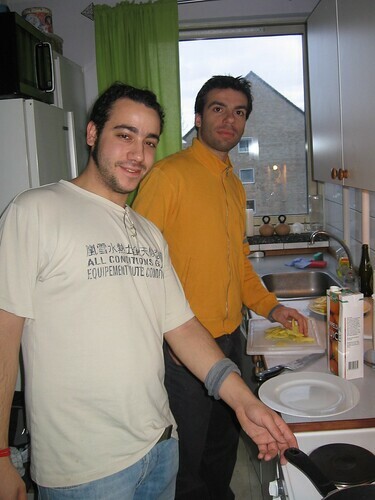 When I travelled to America in 2000 I tried to use Servas – an off-line predecessor of HC started in 1949 – to find some people to stay with in US. The idea was great but in practicality too cumbersome for me. With HC its fairly easy and relatively safe to meet local people and get cheap accommodation. They stayed with us from Saturday till Monday so we went to a private party Saturday night and to Sunday Reggae at Rub A Dub (thanks for that idea, Alice).